Even if you're not an astronomy buff, you have to admit that there's something special about a sky full of twinkling stars. A starry night inspires us to reflect, dream, and hope for the future. YourDictionary's star quotes show the value of taking time to appreciate the wonders of nature. The stars don't look bigger, but they do look brighter. 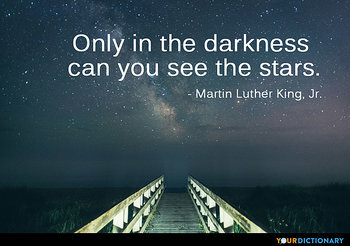 Only in the darkness can you see the stars. 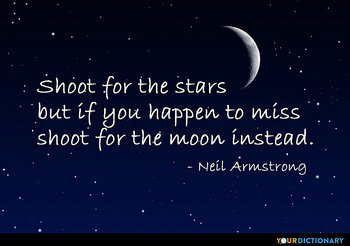 Shoot for the stars but if you happen to miss shoot for the moon instead. When I have a terrible need of shall I say the word religion, then I go out and paint the stars. 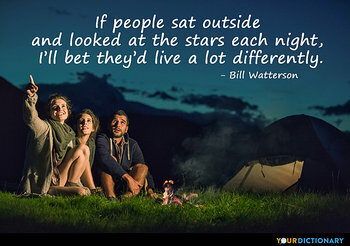 If people sat outside and looked at the stars each night, I'll bet they'd live a lot differently. We are all of us stars, and we deserve to twinkle. I like the night. 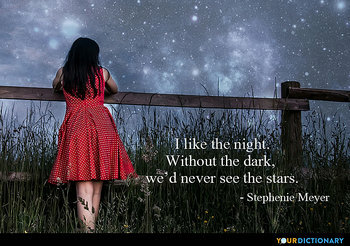 Without the dark, we’d never see the stars.  Said by Isabella Swan, Twilight (2007). 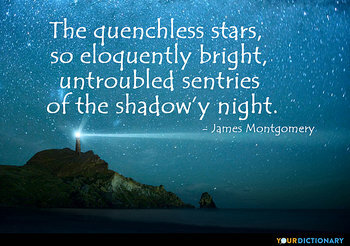 The quenchless stars, so eloquently bright, untroubled sentries of the shadow'y night. Shoot for the moon. Even if you miss, you'll land among the stars.  "Les" Brown is an American motivational speaker, author, radio DJ, former television host, and former politician. Oft in the tranquil hour of night, when stars illume the sky, I gaze upon each orb of light, and wish that thou wert by. Not only do we live among the stars, the stars live within us. For my part, I know nothing with any certainty, but the sight of the stars makes me dream in the same simple way as I dream about the black dots representing towns and villages on a map.  In a letter to his brother Theo, as quoted in Windows of the Soul : Experiencing God in New Ways? (1996) by Ken Gire, p. 91.
Who falls for love of God shall rise a star.  Ben Jonson, Underwoods 32. To a friend. The stars, heav'n sentry, wink and seem to die.  Nathaniel Lee, Theodosius. Probably inspired Campbell's lines. Would that I were the heaven, that I might be all full of love-lit eyes to gaze on thee.  Plato, To Stella. In Anthologia Palat, Volume V, p. 317. He that strives to touch a star, oft stumbles at a straw.  Edmund Spenser, Shepherd's Calendar, July. Twinkle, twinkle, little star, how I wonder what you are! Up above the world so high, like a diamond in the sky!  Rhymes for the Nursery, The Star. Every star waits for the darkness to shine. When we look up at night and view the stars, everything we see is shining because of distant nuclear fusion. Her eyes, the glow-worm lend thee, The shooting stars attend thee; And the elves also, Whose little eyes glow, Like the sparks of fire, befriend thee.  The Night-piece, to Julia, written for his young daughter (1648). When you reach for a star, only angels are there. And it's not very far, just a step on a stair. The stars blazed like the love of God, cold and distant.  Roger Zelazny, Isle of the Dead (1969). And the sentinel stars set their watch in the sky.  Thomas Campbell, The Soldier's Dream. Now the bright morning-star, day's harbinger, comes dancing from the east.  John Milton, Song on May Morning. The twilight hours, like birds flew by, as lightly and as free. Ten thousand stars were in the sky, ten thousand on the sea. For every wave with dimpled face that leap'd upon the air, had caught a star in its embrace and held it trembling there.  Amelia B. Welby, Musings, Twilight at Sea, Stanza 4. But He is risen, a later star of dawn.  William Wordsworth, A Morning Exercise. If there were no night, we would not appreciate the day, nor could we see the stars and the vastness of the heavens. If we could just look up at the stars and see them make beautiful pictures, we would look at everything differently, looking for a picture. We are a way for the cosmos to know itself. The stars are a symbol of nature's beauty and a sight to behold even if you've already seen them a million times before. Dutch post-Impressionist painter Vincent van Gogh, best known for his masterpiece The Starry Night, found looking at a beautiful sky to be a religious-like experience. 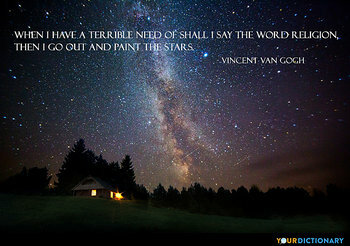 "When I have a terrible need of shall I say the word religion, then I go out and paint the stars," he said. When you look up at the stars, you're reminded of how you are just one small person in a larger universe. You may not know what the grand plan is behind it all, but it's important to enjoy the journey just the same. Bill Watterson, creator of the comic strip Calvin and Hobbes, was a big believer in taking time to live in the moment. "If people sat outside and looked at the stars each night, I'll bet they'd live a lot differently." Looking at the stars may also inspire you to dream big when it comes to reaching your goals. As astronaut Neil Armstrong said, "Shoot for the stars but if you happen to miss shoot for the moon instead."